Last month ended the trial against former leader of the Belarusian Republican Youth Union Leanid Kavalyou. Police caught Kavalyou with a major bribe. The sentence was harsh – seven years of imprisonment in a maximum security colony with property confiscation. The criminal case represents a telling example of how good the "new governing elite" in Belarus is. In 2012 Lukashenka surpassed Brezhnev with regard to the term of reign. A new generation appeared in Belarus during this time period, the generation that does not remember the country being governed by someone else. Pro-government youth in Belarus is corrupt and opportunistic while opposition-minded young people have to work in extremely difficult circumstances. The overwhelming majority of Belarusian young people are not interested in politics or private business. Belarusian state started creating favourable conditions for the business and this has somewhat started to attracted the youth there. But politics still remains an almost closed sphere. In today’s Belarus, the youth politics has only two forms: pro-Lukashenka associations or opposition organisations, which function in the regime of permanent repressions. It is worth mentioning that neither of them influences the society much. The consequences of membership in these organisations may be diametrically different. On the one hand, there’s Usevalad Yancheuski. He used to be the First Secretary of the Belarusian Patriotic Youth Union in the middle of the 90s. Today he works as the closest assistant of Lukashenka and is the youngest official who forms the state ideology in Belarus. On the other hand, there’s Paval Syevyarynets, who headed the opposition Young Front. Today, he is serving his second criminal term. The first one was for organisation of mass protests after the referendum-2004, when Lukashenka changed the Constitution and got the right to run for President for as many times as he liked. The second sentence was for the mass protest after the latest presidential election. At present, the politician is serving the punishment in the form of forcible hard labour – the prisoner is obliged to live in the special facility and to work at the enterprise appointed by the authorities. Authoritarian regimes often create youth organisations which do their best to support the regime and prepare new personnel. 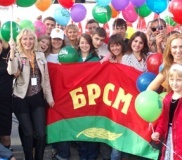 The Belarusian Republican Youth Union (Belarusian abbreviation BRSM) performs this function in Belarus. The BRSM was founded 10 years ago. Then the government decided to unite the two biggest pro-authoritative organisations. The first one was the Belarusian Youth Union, the successor of the Lenin Communist Union of Belarusian Youth, and the second one was the Belarusian Patriotic Youth Union. It is worth mentioning that the BRYU is often called Lukamol in Belarus, as if to compare it with the old Komsomol (Communist Union of Youth). Lukashenka pays the BRSM for the support open-handedly. For example, in 2011 the BRSM received 20.5 billion Belarusian roubles (approximately 6.6 million dollars). This makes 98% of all the finance which is provided to the youth politics in Belarus in total. In the reality, the BRSM gets even more. On 13 January 2003 Lukashenka signed a decree which required that the BRSM local branches were financed by the local authorities’ budget. The government was also responsible to repair the organisation's main office. It is obvious that the authorities created very favourable conditions for the development of a strong loyal youth organisation in Belarus. However, there appeared no strong organisation, although half a million Belarusians are already members of the BRSM. A large number of members does not mean that all of them support the current regime. The majority of people signed up for the BRSM either forcibly or because it gave an opportunity to get a place in the hostel for the term of study in the university or technical school. The BRSM also uses the so-called “secret recruitment”. The mechanism is simple: an order comes “from the above” that new members should join the organisation. A head of a branch (usually this is a school employee who has even his own office at school) takes a list of school students and sign them all up to the BRYU. The BSU student Kryscina Karcheuskaya came across such situation when she found out that she had to pay the membership fee to the BRSM on graduation of the university, otherwise they would not give her the diploma. When these facts become known and Krystina demand to investigate the case, the BRSM refers to “technical problems” and hushed up the matter. Despite the great financial support, administrative resource and half a million members, the BRSM failed to become a strong organisation. In the first place, it is connected with the lack of new ideas. The BRSM, as well as other branches of the regime, realises more and more that the social-economic model which Lukashenka’s regime praised for so long has no future. The second reason for the BRYU’s weakness is the absence of competition. The pro-Lukashenka youth lives in the conditions when the organisation exists by itself and has no contacts with other organisations or the independent media. Although the Belarusian youth takes no genuine interest in the BRSM, it does not mean that the opposition movements are popular. On the whole, the Belarusian youth is not as opposing as many would think. Just think about administrative detentions, fines, expulsions from universities make the daily routine of the youth opposition activists, it becomes clear why the opposition youth movements are not so popular in Belarus. For example, the Young Front activist Raman Vasilieu, has been detained many times during this year and has spent 69 days in the Akrestsina Street detention centre. Besides, Young Front is the only organisation in the country which can compete with the BRSM with regard to popularity. However, the conditions in which the Young Front and the BRSM conduct their activity are totally different. Several Young Front activists are serving criminal sentences today (including leader of the organisation Zmitser Dashkevich). Any activities on behalf of the organisation is banned by the Criminal Code because it was not registered. Activists do not have offices and often serve administrative detentions. The only thing that the Belarusian Republican Youth Union and the Young Front have in common is absence of new ideas. The Young Front is coming through a crisis, the same as the whole opposition, and cannot offer anything new to the society in order to attract new adherents. Belarusian youth does not want to live in a country with no political and economic reforms and no long-term opportunities. They also do not believe that they can change anything in Belarus. For many the only way out is emigration. The research of the Independent Institute of Socio-Economic and Political Studies showed that 65 % of young people want to leave the country. It is interesting that not only the democratic youth emigrates, but the officials’ children as well.